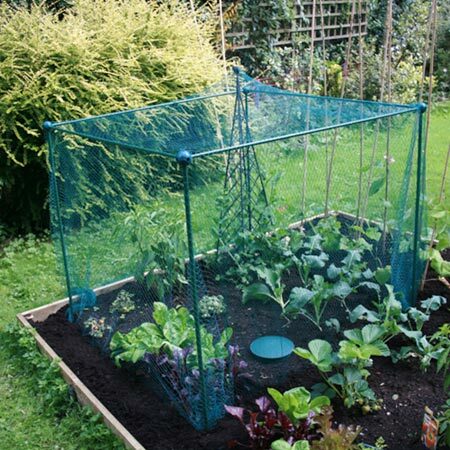 Protect your precious fruit and veg crops from hungry birds! These useful cages have sturdy tubular aluminium frames, in a powder green finish, and can be quickly and easily assembled with the made-to-measure build-a-ball connectors. 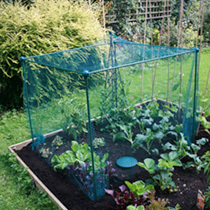 They come with tough, 20mm (1"), green polyethylene square mesh netting and robust feet to secure them to the ground. Available in three sizes: Standard 1.25m (4'2") x 1.25m (4'2") x 1.25m (4'2") high; Double Length 2.5m (8'4") x 1.25m (4'2") x 1.25m (4'2") high; Low Level 1.25m (4'2") x 1.25m (4'2") x 62.5cm (2'1") high.